The Earth has a magnetic field produced by electric currents in its iron and nickel core. The magnetic field forms a set of complete loops similar in shape to those around a bar magnet. The magnetic poles of the Earth are close to the rotational pole (about 11° apart); other planets have much larger angles between their magnetic and rotational poles. The Earth's magnetic field (magnetosphere) normally protects the planet from bombardment by energetic particles from space. Most of these particles originate from the Sun and are carried towards Earth by the solar wind. Near the Earth the solar wind has a speed of about 400 km/s. Charged particles in the solar wind get trapped in the magnetic field and circulate in a pair of doughnut-shaped rings called the Van Allen radiation belts. These belts were discovered in 1958 during the flight of America's first successful Earth-orbiting satellite and are named after physicist James Van Allen, who insisted the satellite carry a Geiger counter to detect charged particles. The outer belt stretches from 19 000 km in altitude to 41 000 km; the inner belt lies between 13 000 km and 7600 km in altitude. 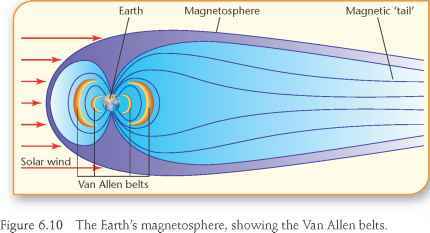 During times of solar flares and increased sunspot activity, the Van Allen radiation belts become overloaded with charged particles. Some of the particles travel down into the Earth's upper atmosphere, where they interact with gases like nitrogen and oxygen and make them fluoresce (give off light). The result is a shimmering display called the northern lights (aurora borealis) or southern lights (aurora australis), depending on the hemisphere involved. 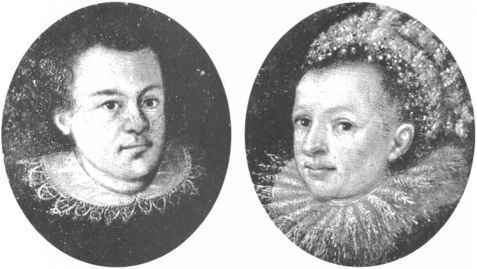 Such events sometimes also interfere with radio transmissions, communication satellites and electrical power transmission.